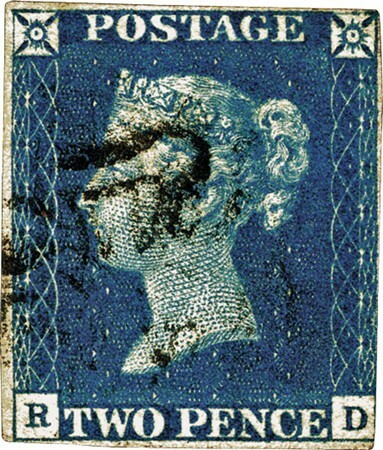 An example of a four margin Penny Black. The world’s first postage stamp, the Penny Black, officially turns 175 on 6th May 2015. Today, stamps are one of those everyday things which we take so much for granted that it’s impossible to visualise a world without them; but 175 years ago sending and receiving letters was a major operation, and a relatively expensive one. Letters were charged according to the distance travelled and the number of sheets. To send a letter from London to Glasgow cost 18 pence – a couple of days’ wages for the average man – and it was the recipient who paid, not the sender! In 1837 Rowland Hill led the campaign for Uniform Penny Postage, arguing that the main cost of the postal service was the cumbersome method of computing postage. A flat rate of a penny, paid by the sender, would slash costs dramatically – but to achieve this he had to devise a method of prepaying postage. His answer was the introduction of prepaid stationery and also a label just large enough to bear the stamp and smeared on the back with a glutinous wash – this label would eventually become the Penny Black. The Treasury organised a design contest for the new adhesive stamps but none of the submissions were considered suitable. Although he was not one of the prize-winners, Sir George Mackenzie came closest to what was eventually used for the stamp – an upright oblong with a portrait of Queen Victoria, with POSTAGE at the top and the value at the foot. The portrait was drawn by Henry Corbould from an effigy of Victoria when she was only 15. 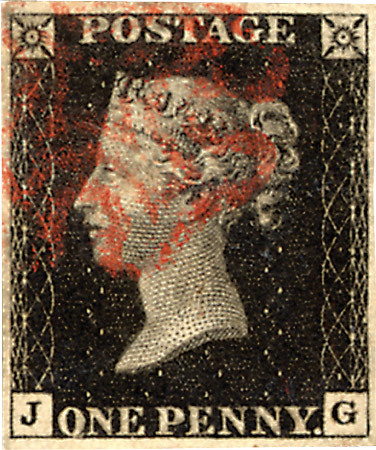 On 6th May 1840, the Penny Black went into official use, followed two days later by the Twopenny Blue. Although a huge success, these stamps had a flaw and within weeks of their introduction, Rowland Hill’s worst fears were realised when it was found the general public had found ways of washing off the postmarks from the stamps and reusing them. Immediately he set about a way to combat the problem in a series of experiments which has become known as the Rainbow Trials. 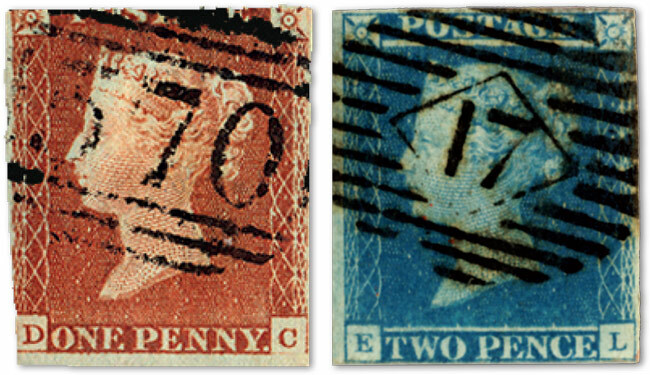 As a result of the trials, less than a year after they were issued, it was decided to replace the Penny Black with the Penny Red and the Twopenny Blue would be reissued with added security measures. Despite its short life, the legacy of the Penny Black still lives on today, 175 years after it was first issued. Its place as the world’s first postage makes it a must have for any collector. Click here to see our range of available Penny Black related products.